Preheat oven to 350°F. Butter and flour two 4-inch springform pans; set aside. In bowl combine flour, baking powder, baking soda, and salt; set aside. In second bowl beat butter with electric mixer 30 seconds. Add sugar, beat until combined. Add egg, sour cream, coconut milk, coconut rum, and vanilla. Beat until just combined. Gradually add flour mixture, beating until just combined. Fold in toasted coconut. Pour batter into cake pans. Bake 20 to 25 minutes or until toothpick inserted near center comes out clean. Cool pans on wire rack 10 minutes. Loosen pan sides. Remove cakes from pans; cool thoroughly on wire rack. 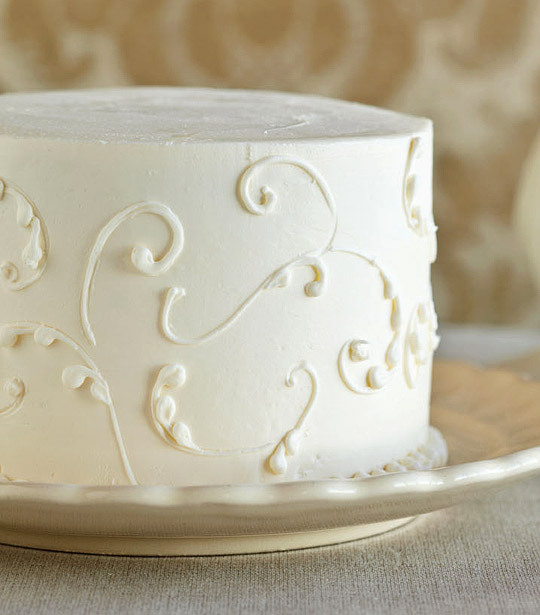 To assemble cake, trim tops of cake layers so they are level. Split cake layers horizontally to make four layers. Place one cake layer on serving plate. Spread one-third of Key Lime Filling on top. Top with second cake layer. Repeat, alternating filling and remaining two cake layers. Frost with Vanilla Buttercream, smoothing frosting on sides and top. Place remaining buttercream in pastry bag fitted with small round tip. Pipe design around sides of cake. Makes 1 cake (2 servings). In saucepan whisk together 1 egg yolk, 2 tablespoons sugar, and 2 teaspoons key lime juice. Cook and stir until thickened. Stir in 2 tablespoons butter, 1/4 teaspoon finely shredded lime peel, and 1 tablespoon sweetened condensed milk. Cover; chill until ready to assemble cake.